Thank you for your interest in Wilsede Science Connections. The Wilsede Experiment “Modern Trends in Human Leukemia” started Midsummer night 1973, for three long days and nights in the 350 years old farmhouse “De Emhof”. Those who have joined the bienal horse-drawn expedition to Wilsede in the inner Reaches of the Lümeburger Heide south of Hamburg, have enjoyed stimulating and informal Discussions. The rustic “De Emmhof” has provided a convival setting for many lively, and at times provocativ, debates. The educational component of Wilsede enjoyed both – Students and golden oldies alike - is not to be underestimated, in an increasingly specialised, technical and rapidly developing research arena it serves a vital function. The Wilsede meetings have proved the ideal forum for practising medical doctors and basic scientist to meet together and discuss new innovations from molecular biology to treatment strategies to help leukemic and cancer Patients. We selected for historical and still actuell informations 10% of the Wilsede publications in this Internet File“Modern Trends in Human Leukemia” . New informations about history of leukemia, 1973 - 2011 - find here. The Maximow Award is taking place within the framework of the German-Russian Year of Education, Science and Innovation 2011/2012. Under the title "Development of Stem Cell Transplantation: a Debate", it is kindly funded by the German Federal Ministry of Education and Research (BMBF). It is a special cooperation project designed by the Transplant Centers of Hamburg and St. Petersburg and the journal Cellular Therapy and Transplantation (CTT, www.ctt-journal.com). Join the competition here on October 1st! A few words about my last work, which I called " Alexander Maximov's world". I could think that many of you had to learn or to study his experiments and results, when they were students. Well, I am not competent enough to give a valuation of his work or meaning in histology. But the few things I read about his work and life gave me a great deal of respect and admiration. Specially how he drew and painted the results of his experiments in such a filligran and precise way. Amongst scientists, often the work of a colleague is not always considered with great admiration rather more with a feeling of respect or competition. So, when I put up some kind of a monument for Alexander Maximov, it is the painters admiration for a scientist, who probably drew much better than I ever would do in histology. Now to my work: There is the real and spiritual world of Alexander Maximov. The polarisation of the idea is seen on the right side which shows the three stations in his life. First: St. Petersburg, where he worked at the Military Medical Academy for some years. Second: In Berlin, the Charite Hospital, where he worked like his famous colleagues Arinkin and Botkin before. And last station of his life was the University of Chicago where he had to emigrate with heavy heart after october revolution. On the left side you see two blood pictures which have been drawn by Alexander Maximov. Third: The upper picture which looks like a Super Nova is a cell of a mouse fibroplast which Alexander Maximov in his time could not see like this, as the electronic microscope wasn't invented then. This is the contemporary level of this work together with the circled Wilsede motif over the tower. If you look closer and I could help everybody with my magnifying glass, you discover that Maximov's two blood pictures are drawn in the silhouette of the Emhof (up side down) and the Granary. The Center shows the portrait of Alexander Maximov about the time as a young man in St. Petersburg and it shows close to his heart the entrance to his laboratory in the Military Academy. To end now, I sum up the key idea may be called 5 seconds of inspiration and five weeks of rather hard work. 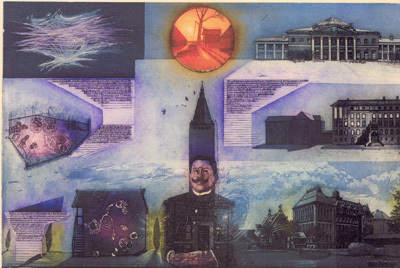 Alexander Maximov as a tower surrounded by the real buildings St. Petersburg, Berlin and Chicago and on the other hand surrounded by his spiritual buildings, the blood pictures in the silhouette of Wilsedes granary and the Emhof. So I thank you for accompanying my explanations of Alexander Maximov from St. Petersburg to us here in Wilsede. In the beginning the gods did not at all reveal all things clearly to mortales, but by searching men in the course of time find them out better. Nicht von Beginn an enthüllen die Götter den Sterblichen alles,aber im Laufe der Zeit finden wir, suchend, das Bess`re. Nearly every month there are workshops, conferences or congresses devoted to the problems of human leukemia, for our knowledge is quite limited. In large measure, these conferences have been concerned with Special aspects of leukemia. In this workshop we have brought together scientists from different research areas in human leukemia. Therefore the title "Modern Trends in Human Leukemia does not only apply to the discussion of the importance of molecular biology, but also includes the 100 year old history of the leukemic cell as the basis of biological and irnmunological aspects in human leukemia. Modern trends in human leukemia need to be discussed based on the past, present and possible future information gathered from all different, but related topics. The idea to bring together highly qualified biochemists, medical doctors, and virologists to learn, like students, about each other's fields has been very unusual. But to understand human leukemia, the virologists and biochemists have to learn more about the properties of the human blood cell, and the medical doctors have to learn where and how leukemic misinformation can influence the normal regulation of the molecular control mechanism in a blood cell. To start such a workshop, therefore, was to start an experiment. In this experiment, the hope was that these scientists would learn about each other's research fields and also teach others about their own specialized fields as well. The final aim was that those in the workshop would discuss the whole problem of human leukemia, and cooperative research programs among the different specialized groups would be stimulated. with: Elena Frolova, Joseph Chertkov, Elena Elsner, Hanne-Lore Neth, Rolf Neth, Alexander Friedenstein, Boris Afanasiev (1988, initial meeting Buchholz-Nordheide, Germany. In 1988, after the last Wilsede meeting, Elena Frolova and her friends had the marvelous idea of organizing a Volga Wilsede meeting. Today, I am very pleased that this idea became true. Every day, we dream of freedom and peace. A small part of this dream has today come into our hands. Everybody here has done his best to come together for good science and in friendship. I am sure that this Volga Wilsede meeting and the Neva Wilsede Meeting will become part of the international tradition of good science In a peaceful human atmosphere. For us this door IS open: let us go through. To keep the Wilsede window open for coming generations of young scientist we need your support – in terms of both, personal academic information amd, at a modest level, financially. To keep this Idea alive we need the help of our scientific friends arround the world. Robert Gallo , assigned by Harald zur Hausen , George Klein and Sol Spiegelman informed us about Virus and Cancer in Wilsede . In January 1985 I got a letter from Dr. Koch (read the original - and the answer from Dr. Neth) He informed me about HTLV III infections around Karlsborg. I agreed that we have to prevent by education and bloodtest . 1990 Robert Gallo was on the Volga Wilsede Meeting in an Interview critical optimistic for a vaccination. In 2010 40.Millons need education and a safe haver for testing, hope for a therapy and vaccination. After a History of 40 years Wilsede Meeting, the Wilsede Club is a world wide network of more the 2000 Wilsede Participants and Wilsede Friends. In the spirit of Pastor Bode we need support for keeping Wilsede the delightful and unspoilt place were students and outstanding scientist enjoyed together nature lore and science. In this restless World www.science-connections.com could help the younger scientists and students to find a bridge to live to see the science. Wilsede Meeting 2010: find the original Wilsede poster here. Wilsede Meeting 2010: find an improved Wilsede poster (list of names) here. Wilsede Meeting 2010: view an image with most participants here. Wilsede Meeting 2010: find some interviews with participants here. Ludwig Wittgenstein, "On Certainty" - "Über Gewissheit"
670. Man könnte von Grundprinzipien der menschlichen Forschung reden..
671. But for all that - even if they trust me - they might believe I had been dreaming or that "magic" had made me imagine it. .. I cannot seriously suppose that I am at this moment dreaming. 671. Dabei könnten Sie aber -auch wenn sie mir trauen-glauben, ich habe geträumt oder ein Zauber habe mir das eingebildet... Ich kann nicht im Ernst annehmen, ich träume jetzt. On Certainty - "Über Gewissheit" 1969,1975 by Blackwell Publishing Ltd.
“Wem es vergönnt ist, an dem Aufbau der exakten Wissenschaft mitzuarbeiten, der wird mit unserem großen deutschen Dichter sein Genügen und sein innerliches Glück finden in dem Bewusstsein, das Erforschliche erforscht zu haben, und das Unerforschliche ruhig zu verehren”. allow me please to ask for personal help. James Clerk Maxwell (1831-1879) and Heinrich Hertz (1857-1894) recognised that light is also an electromagnetic wave movment in space. Their inspiration was not hope of profit, but rather the dream of a new freedom, this hope we share. For this to be successful in the Wilsede Portal http://www.Science-Connections.com we look for help - in terms of both personal, academic information and, at a modest level, financially. Don Pinkel: A Response to the letter of Dr Pulsipher et and colleagues. Registration for the XVIII. Wilsede Meeting on “Modern Trends in Human Leukemia and Cancer” is now open. The meeting will be held from June 19 – 23, 2010. Illustration made by Immanuel Nobel on how ships are blasted with mines, here being demonstrated in his presence and that of the Tsar of Russia. In his last will, signed on November 27, 1895, we find the well-known prize formulation "to the person who shall have done the most or the best work for fraternity between nations, for the aboliton or reduction of standing armies and for the holding and promotion of peace congresses." Alfred Nobel promptly informed Bertha von Suttner of his decision, and she expressed her delight: "Whether I am around then or not does not matter; what we have given, you and I, is going to live on." Perhaps the most famous Solvay conference was the October 1927, where the world's most notable physicists met to discuss the newly formulated quantum theory. The leading figures were Albert Einstein and Niels Bohr. Einstein, disenchanted with Heisenberg's "Uncertainty Principle," remarked "God does not play dice." Bohr replied, "Einstein, stop telling God what to do." Seventeen of the twenty-nine attendees were or became Nobel Prize winners, including Marie Curie, who alone among them, had won Nobel Prizes in two separate scientific disciplines. Mstislaw Leopoldowitsch Rostropowitsch playing in Berlin 1989, at the fall of the Berlin Wall. The responsibility for leukemia patients is the center of our activities. With our optimized diagnostic program we help improving both life expectancy and quality of life. Bei DFG Science TV finden Sie Antworten: Nach der erfolgreichen ersten Staffel dokumentieren ab dem 16. Juni 2009 wieder zehn ausgewählte Forscherteams bei DFG Science TV mehrere Monate lang ihre Arbeit mit der Kamera. In dreiminütigen Kurzfilmen erzählen die von der Deutschen Forschungsgemeinschaft (DFG) geförderten Wissenschaftlerinnen und Wissenschaftler vom Alltag. Dr. Pirofski delivered a dynamic lecture that linked a particular event in medieval history the Black Plague -- with the way cultures react to pandemics. Image gallery from Wilsede Meetings 1973 - 2008: here. 1973-2006 here: Fritz Anders, Robert Gallo, Mel Greaves, Harald zur Hausen, Henry Kaplan, Georg Klein, Av Mitchinson, Susumu Ohno, Don Pinkel, Janet Rowly, E. Donnall Thomas et al. Get the Flash Player . Cellular Therapy and Transplantation Journal is a new international, peer-reviewed, open access journal which publishes articles in the fields of cellular and genetic therapy and transplantation. Raisa Gorbacheva Memorial Institute: Interview with a Gerald Wagemaker , "Leukemia therapy in Belarus"
Karl Welte and the History of G-CSF Symposium ,"Disorders of Hematopoiesis"
Open Access Journal coming soon. View the presentation here (Quicktime movie).